Susan Craig-Greene (Dale Farm Housing Association): Susan is originally from Oklahoma. She graduated from Oklahoma State University with a degree in International Relations. Susan then won a Bailey Scholarship to enter the University of Leipzig, where she studied the changing role of women in reunified Germany. She returned to teach in Germany two years later on a Fulbright scholarship and entered the private sector to work at an IT market research consultancy. Susan then returned to university and earned an MA in Human Rights at the University of Essex, where she earned a distinction for her dissertation. After graduating, Susan took a placement with Amnesty International’s International Justice Project. She left Amnesty following the birth of the first of her two children and began studying documentary photography. She lives close to the Dale Farm site. I’ll never forget that first St Patrick’s Day I spent with the Dale Farm residents. Basildon Council, are you listening? No Big Fat Gypsy Eviction Here. We are Human Beings. There are many ways to protect the green belt. Evicting Dale Farm Travellers is not one of them. 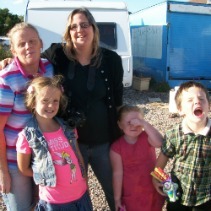 Why is local prejudice against Dale Farm Travellers so acceptable? We will all miss John Flynn. It is unfortunate how some of my fellow residents feel about the Travellers at Dale Farm.